This was our second trip to Lion Country Safari with our second set of grandchildren. First, the park is not really in West Palm Beach, Florida, although it advertises itself as such. It is really in Loxahatchee, Florida, way, way out west. 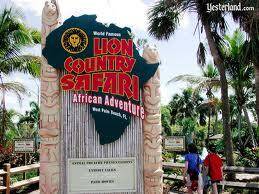 It is ten miles west of the Florida Turnpike, exit 97, or I-95 to Exit 68, at 2003 Lion Country Safari Road. Second, it does not matter if you go summer or winter, if the weather is warm, the lions and most animals will be sleeping or looking for shade. It is less crowded in the summer. The better weather is in the winter. We are glad we went. We are glad we do not have to go again, having taken all four grandchildren already. There are discount coupons you can get on line and in the newspapers. We always get the Miami and Fort Lauderdale newspapers. In the Fort Lauderdale newspapers, the discount coupon is for $8 off admission on each person in vehicle. In the Miami newspapers, the discount coupon is for $10 off admission on each person in vehicle! Either way, it is costly to go to Lion Country Safari. For two grandparents at senior rate, two children age three and over, and one parent (yes, it is best to have at least one parent with you), it will run you about $100 in admission and parking. The parking charge is very high. We had real Carvel soft ice cream which was a treat, but there is no need to eat in the park and eat their very poor food. On the way, you will pass more fast food and passable food restaurants than you would want. Best to arrive after you have eaten an early lunch elsewhere. Lion Country Safari is divided into two ‘experiences.” First, you drive in your own car around a nature preserve, divided into different sections. The speed limit is 8 miles an hour. The traffic keeps you at that speed. To go any faster, is to endanger the animals, as it is youwho is in the “cage,” the car and it is the animals who roam around. Many come right up to the car, and you can drive so close that they are steps away from you. We passed a large herd of wild horses and one wild horse separated from the herd that looked like it had been hit by a car, limping and uncomfortable. What concerned us was that an attendant shoveling hay about twenty feet away did not notice. We wanted to open our window and shout to her, but it is clearly written on signs all around the park to never open a window. Then, we thought, maybe they want nature to take its course. However, on the CD you get as you enter to guide you through the park, the speaker says the park prides itself on the care of the animals. The CD is very well done. It tells you what you are going to see and about the animals in each divided section. There are more ostriches than any other animal. As a matter of fact, the speaker on the CD says there are ostrich eggs available for sale seasonally. The ostriches are very inquisitive and come right up to the car window and, other than the mass of cars that block the road, they often block the road. In the lion country area, there are two prides, each with one male and three females. Of the eight lions, one male and one female were awake. In the last divided area, where the rhinos are, there are the most animals you can see. We would tell you to bypass much of the previous area to get here. If you do the entire park, stopping frequently, it does take you the hour and a half they estimate to get through the park. By the time our little ones got to this last best area, they had had enough, and just wanted to get to the amusement park. We spent the least amount of time in the best part of the park as a result. There were, in addition to many rhinos, many zebras and many giraffes, even a newborn giraffe. This was the coolest area. This Grandma understands why they leave the best for last, but the younger grandchildren will have already lost patience. Take the short cuts/by passes you can take when they are available (do not bypass the lions, however) to get to this last area faster. The amusement park is mostly “free,” or I should say, the rides are mostly included in admission. We never made it to any of the animal shows. The grandchildren, at ages three and seven, were “animaled out.” They did like the carousel, going on several times in a row. They liked the elephant looking ride like Dumbo at Disney, but more lame. Our older grandchildren, when we went with them, liked the paddle boats. We all liked the ice cream. The grandchildren liked the water spray area which was worth thirty minutes for them to play before the ride home. Bring towels and a change of clothes. Bring your own snacks and bottled water. There are stores strategically located to get you to buy mediocre quality stuffed animals. If you are inclined to buy the grandchildren something, opt for the Carvel, and buy them a stuffed animal elsewhere. Fortunately, our grandchildren slept on the long hour ride back to Fort Lauderdale. Otherwise, definitely bring electronics for the car. When Lion Country Safari advertises “hundreds of animals on over 300 wild acres,” after being there, it seems like an exaggeration. However, there may be some time of the year when most are not sleeping. We did not find that time in two separate trips. When Lion Country Safari advertises, ‘Enjoy a Safari Adventure in the preserve, then stroll though our 55 acre amusement park with animal encounters, rides, water sprayground and exhibits, “ they accurately describe a pleasant three to four hours with grandchildren, not in West Palm Beach, but far, far west in South Florida. Opt for the winter time for a visit.